I have a plan for my lawn. I have a plan to cultivate it as a cut meadow filled with various flowers, including some wildflowers, each with its own season. I started working on my plan a few years ago by planting crocus corms directly in the lawn, phase one. Two years ago, I think I planted around 400 corms. This past fall, I planted a little over 1,000 corms. 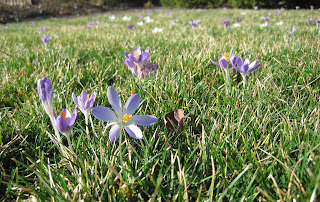 It sounds like a lot of crocuses, but spread across a big lawn, it can look like "not much". I will plant more crocus corms each fall, mostly the smaller, earlier flowering Crocus tommasinianus, which is a favorite of Gail from Clay and Limestone, who hosts Wildflower Wednesday on the fourth Wednesday of the month. Gail encourages us through her blog to think about how to incorporate wildflowers into our gardens and our lives and to do all we can to garden with pollinators in mind. I have a pretty good method for planting the crocus corms, so believe it or not, I can plant 1,000 or so in about four hours. I will plant any crocus varieties that can be purchased in large quantities, except for gold colored crocus. From a distance, a gold crocus can look like a dandelion. Dandelions are not part of my plan for my lawn. Early this spring, within a matter of a few weeks, I am also going to sow seeds for johnny jump ups (Viola) and chamomile in the lawn. They are part of phase two. The kind and generous people at Botanical Interests Seeds remembered me talking to them about this idea when I visited their booth at the last Garden Writer's Association meeting and sent me ten or so seed packets of each to try out. 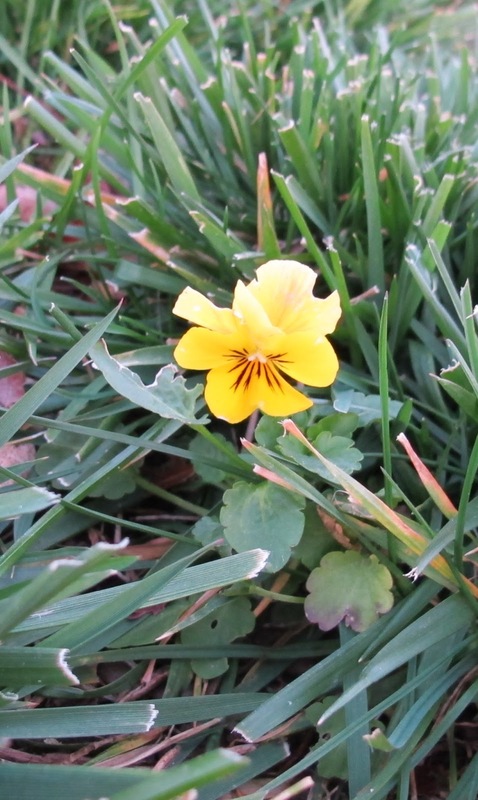 I already have violas that show up here and there in my lawn, so I am hopeful that if I purposely sow seeds for them, they'll cooperative and grow for me. 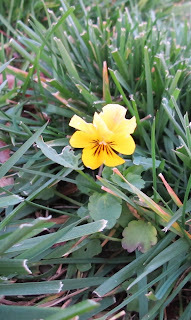 Yes, I know this little viola is yellow like a dandelion, but if it is willing to show up in the lawn, I'll let it stay. I also want to grow chamomile because it smells like apples when you cut it with a lawn mower. One of the keys for growing these flowers and other wildflowers in the lawn is to avoid using herbicides, both those that stop seeds from germinating (pre-emergents) and those that kill broadleaf plants. Another key, I think, is to mow high to avoid chopping the flowers back, especially the crocus, before they have a chance to flower and in some cases, set seed. However, I'm still working out what this height should be as "mow high" is also one way to choke out weeds, which presumably don't do well competing against the higher grass. Another key is to commit to hand weeding out undesirable weeds, including dandelions and thistle. Hand weeding can take some time, but if I am persistent and use a good dandelion digger, I find that I can keep ahead of the bad weeds, for the most part, without too much effort. Your results may vary. Oh, did I mention that I would also love to see wildflowers like spring beauties (Claytonia virginica) blooming in my lawn in the springtime? I'll work on adding them in future years. I also plan to let clover grow in the lawn where it chooses to come up. The bunnies like to eat it. I have many bunnies around my garden and when there is clover to eat, they tend to not eat in the vegetable garden. So clover stays. And of course, violets are also welcome in my lawn. Crocuses, johnny jump ups, chamomile, clover, spring beautifies, and violets -- it's a start of what I hope is a wonderful cut meadow, an interesting green space that makes my garden one that is healthy and hospitable for wildflowers, bunnies, birds, and me. Sounds like the perfect plan Carol. I know the wildlife will love your efforts. It's splendid plan and I am wondering if you have Salvia lyrata~it looks wonderful in a lawn. Thanks for joining along with WW and for the delightful shout out for my pollinator efforts. carol, this sounds fabulous. I had grape hyacinths and violets in my lawn at my previous home. Hi Carol....I would love to see a picture of this and also find out what you'll plant for late spring and summer. I'm doing something similar in front of my fence. A few years ago the area was covered in coreopsis, but they are too tall and the grass grew up and looked messy. So now I need to think of another flower option. Such a lovely idea and it will be both beautiful and wildlife friendly. Oh Carol, i can already visualize the wonderful landscape you are creating, we will expect it next year. But in my imagery i can see snowdrops at the borders, oh how so beautiful. By the way, your link at WW is not working, yesterday i thought it was just out, now i tried again, something is wrong in your link URL. Carol- I like flowers in lawns too. Your crocus plans are very enterprising, they must be lovely in drifts. I have to admit I have 4 kinds of dandelion-like weeds that flower in succession in my lawn despite my efforts, at least they give the bumblebees something to eat. My last-ditch effort is to pick off all the seed-heads before blow. My favorite lawn flowers are lawn daisies, Bellis perennis; Prunella vulgaris, Self-Heal; Ajuga, and I have a small violet that spreads rampantly. I find that Spring Beauty lies dormant in my former woodland soil, but it seems to spring up after I kill weeds by mulching heavily in semi-shade under forest edges, more than in lawn. I love your plans, Carol. It will be lovely. Just remember, dandelions are edible! But even if you don't put them in salads or make wine with them (neither do I!) if you love butterflies, they are not weeds:) A few butterflies (and other insects) utilize them fully! Just like clover, which the bees love, dandelions are not really a 'bad' thing.